Here are cheap deals for the OBS Cube Mod Kit 80W. 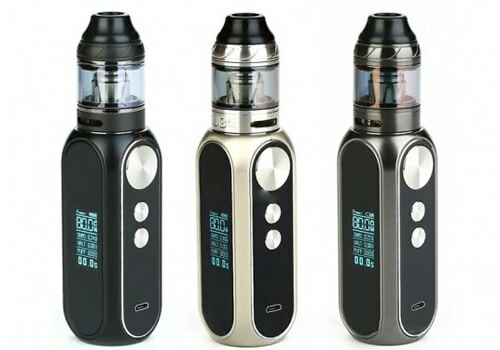 This all-in-one vape system with Cube Mod and Cube Tank features 80 watts of power, a display screen, an integrated 3000mAh battery for long vaping times, fast charging, a 4ml tank capacity, a top fill system and mesh coils for better flavor. The Cube Mod measures 31mm x 81.5mm, is made from zinc alloy and has available colors that include black, chrome/alloy and gun metal. The name comes from the mod’s appearance that looks just like an elongated cube, but with rounded corners. On one face of the Cube Box Mod, you will see a large metal fire button, 2 smaller adjustment buttons and a micro USB charging port. On an adjacent side, there’s a 0.96 inch display that has a menu with vertically oriented vape data. Indicators you may see on the screen include current mode, charge level of the battery, wattage, resistance, voltage, number of puffs and puff time. Integrated into this mod is an internal 23600 battery which has a 3000mAh capacity for incredible vape times. Recharging the cell takes about 2 to 3 hours and is done by plugging it into any wall outlet with the cable in the Cube Kit’s box. The Cube can only operation in variable wattage mode and can reach 80 watts of power. Also included in the OBS Cube Mod Kit is a Tank. It has dimensions of 25.5mm x 47mm, is made from stainless steel and has a 4ml juice reservoir with top fill system. Airflow intake on the Cube Tank is via dual air slots that can be fully adjusted via a bottom airflow control ring. The Cube Kit works with mesh coils and also traditional ones. The mesh coil included with purchase is the 0.2ohm M1 that fires in the range of 30 to 80 watts, but should be used in the range of 35 to 70 watts. Or you may prefer to use the M6 0.2ohm head that has a 40 to 80 watt range, but works best from 50 to 70 watts.